Astrology is the ancient art of interpreting the fractal nature of moments in time. In the words of Ecclesiastes, 'To every thing there is a season, and a time to every purpose under heaven'. By looking at the current placements of the planets, much like reading the hands of a great cosmic clock, it is possible to work with ancient symbols in practical ways that entice our perceptions onward toward wider horizons. Astrology works because of the inherent symbolism of archetypal patterns; ours is a synchronistic universe in which everything exists in interlocking harmony - consciousness creates universe, which in turn recreates us in its image of our image. The planets are meaningful because existence itself is inherently meaningful. 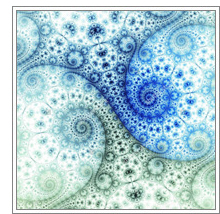 Fractals are not only beautiful, they provide the key to understanding the complexity of Nature and how to measure it. To the Ancients, everything in our experience was an expression of geometry and number. What Plato called forms, and Jung called archetypes are the same self-similar abstractions symbolised by the planets and their movements over time in the entangled universal mindscape. Ours is a Participatory Universe, in which everything we do changes it as it manifests in the eternal dance of universal opposites (Yin and Yang). The Universe is a network of relationships; the play of polar opposites: positive and negative, being and non-being, above and below, mutually interconnected, one implying the other. It is the playful, fractal nature of space and time that creates the dynamic attractor of material manifestation, which in turn gives rise to the multiplicity of physical forms that make up the fabric of our lives. Space, time and mind all emerge from the One Mind, of which you are a physical embodiment, one form of Mind; just as a wave is distinct from the water around it, so you are, in this moment, a distinct Self, yet existing only in relationship with the whole surface of Time. For the astrologer, the Universe is synchronicity in action - and every moment a unique yet deeply connected entity: Whatever comes into being cannot help but carry with it the characteristics of the time into which it is born. Your uniqueness is your magic. Need Travel or Relocation Advice? An AstroLocality Map and Guide are essential to have when planning a move, a holiday or travel anywhere.